how seriously proud of my child am i that she made these awesome space-inspired vans? real, authentic vans were a spotvare (aka a large load fell off a container) in netto this week and sabin said she wanted a pair that she could paint. hey, for 400 kroner (just do me a favor and don't convert that to dollars), i said, "why not?" they were black when she started, but now they're like a total space odyssey. and i have to say it makes me very proud. she used a combination of washi tape (to protect the edges), textile paint, nail polish and nail sparkles to create this starry starry night extravaganza. 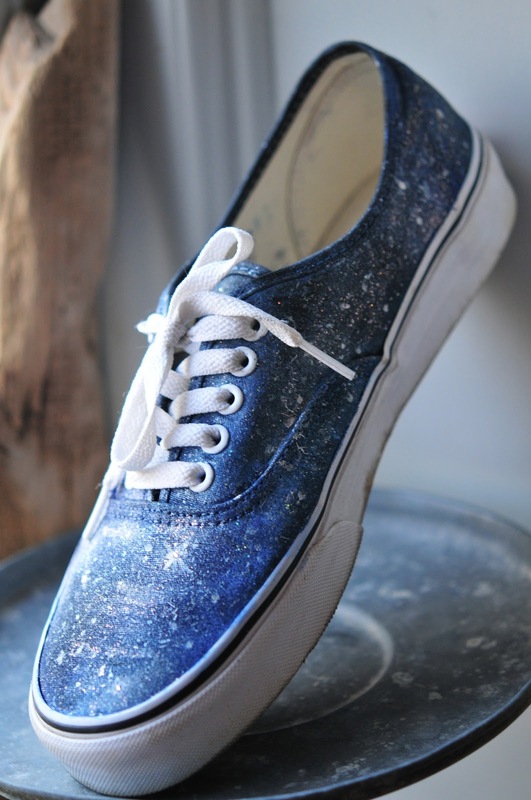 if she were to open a big cartel shop, would you be interested in some spacey vans of your very own? totally unique and one-of-a-kind? (plus a matching pair, not just a single - the other one wasn't finished yet and i couldn't wait to take the photo, as the light was fading fast., but she is working on a pair.) as she went to bed, she was already fantasizing about new designs...night & day, rainbows, summer & winter. the possibilities are endless. and they could also come in converse. I didn't listen. I did the conversion.